That’s Rodgers and Oscar Hammerstein, not Mike Chen — but the spirit of the book is in that second line, so I’m going to use it. I found myself singing those lines a lot while thinking about the book. If you’re a father to a daughter, you will love this book. I don’t think it’s necessary to appreciate the book — non-parents, mothers, people with sons should still be able to see how good it is and to empathize with the characters. But I can’t imagine any Father of a Daughter won’t see themselves (and Daddy’s Little Princess) in these pages. In the past, I’ve said something about not really liking non-Doctor Who Time Travel stories. I’m starting to think it’s because I haven’t been reading the right kind of Time Travel stories. 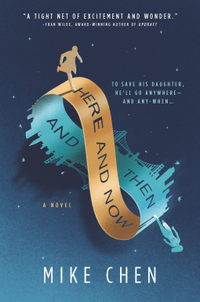 In the last year (give or take), I’ve read and loved four Time Travel novels — All Our Wrong Todays by Elan Mastai, Just One Damned Thing After Another by Jodi Taylor, Paradox Bound by Peter Clines, and now Here and Now and Then by Mike Chen. In all of them, the tropes of Time Travel are honored — while played with a little bit — but are really just excuses to tell very real emotional stories about some pretty great characters. Which is what Who does best, too, now that I think about it. So maybe for me, Time Travel has to be a means to an end, not the end itself. Maybe I should leave the introspection for another time, and just get on with talking about the book, eh? My point was supposed to be that, like Matsai, Taylor and Clines, Mike Chen has surprised and excited me beyond expectations and hopes. The day I started (and fell in love with) this book, I tried to explain it briefly to someone. I did so in a way that was clearly reductionistic (because, that’s what you do in a couple of sentences), spot on, and yet horribly inaccurate — all at the same time. Here’s what I said: It’s a gender-flipped Outlander, except the protagonist goes to the future instead of the past, and they use science-y stuff to the Time Travel instead of magic-y stuff. Kin (pronounced /ˈkēn/) is, or was — or will be — a Secret Agent for the Temporal Corruption Bureau in 2142. He came back to 1996 to prevent a Twenty-Second Century criminal from altering the timeline for their own profit — and did so. But things went wrong in carrying out the mission and he was unable to be returned to his time. So he got stuck in 1996 for a bit. For him, it was 18 years. For the TCB it was a couple of weeks. For Kin, he had to give up hope of rescue, get a job — and then he fell in love, got married and had a kid. He has a nice life — he’s a success in IT for a video game company, he’s a pretty decent amateur chef and is working on trying out for a reality show for home chefs, his wife is great, and his daughter is, too. Miranda’s fourteen, a soccer star, wicked smart, a SF nerd and loves her parents. Then his partner Markus shows up to bring him back to their time — Kin’s largely forgotten his former, er, past, er…other life and has really become a resident of 2014 (this is explained in science-y wibbly wobbly, timey wimey terms that actually make sense in context), so Markus has to take him by force. Once he’s back to his future, Kin starts remembering his life — his job, his hobbies, his utter ineptitude in the kitchen — and his fiancé (Markus’ sister). But it doesn’t come back to him immediately, and he has to work at it. One thing he can’t do, is let go of his Twenty-First Century life, and he schemes for ways to remain a part of Miranda’s life. For awhile, this works — but only for a while. The instant it starts, every reader knows that Kin won’t be able to fly under the radar forever and he gets found out. It turns out that what he’s doing risks the future — but the only fix the TCB has in mind will mean Miranda’s death. While Kin can understand their decision, there’s no way he can let that happen to his daughter. I don’t think I’ve said (much) more than the publisher’s blurb — but I can’t say much more without spoiling. And trust me, Chen’s version is much better than mine would be. Kin is a great character — he’s thoughtful, skilled, smart — and human. He makes a lot of mistakes, his judgement is shaky (not just when it comes to Miranda, either) — but he tries to do the right thing. His loved ones — in all eras — are people you can believe are in his life and you can see why he cares for them, and you do too — because of Kin. That’s all I’m going to say about the other characters because I can’t talk about any of them without ruining something. The world of 2142 is just about perfect — it’s different than 2014, but there are straight lines connecting it all. It’s the little changes that make it right — often Kin’s perspective allows us to see it. Like the offhand way he mentions to someone that temperatures are 5 degrees lower in 2014. Or the way he reacts to a recreation of 21st Century fast food. There are things about Mars that are just tossed off in conversation without explanation that clearly mean humans are doing something on the surface of the planet. Don’t ask me what — Chen doesn’t say. It even took me seeing him use the phrase a couple of times before I realized what it meant. But once I did, I got very excited about how he pulled it off. There are many subtle details like these that really make this a believable read. The story and the writing are imaginative and playful — you will smile a lot while reading this. But the instant that Markus shows up and says it’s time to go, you just know that your heart is going to get broken in these pages. And you will be right. Thankfully, Chen will give you almost as many reasons to be happy — some small, some big. It’d have been very easy to make this maudlin or depressing. He could’ve also make this a playful romp. Chen instead walks the tightrope between the extremes in a performance worthy of Philippe Petit. The pages fly by, I really couldn’t believe how quickly I read this — part of it was because I just had to find out what happened to Kin, Miranda and the rest — but part of it was Chen’s writing. Despite hitting you with all that he hits you with, it’s very (and at times, deceptively) easy to read. This worked for me on just about every level and on just about every front — it checked all of my boxes and did just about every superlative thing I can think of. But the ending — I loved the ending, don’t get me wrong — just felt a little too easy. Things worked a little too well. Which the fanboy in me loves, but . . . I dunno, the book was filled with twists and struggles and challenges and the in the last three or four chapters everything was a little too easily overcome — and even the challenges melted away. And yes, I cheered, but I wanted Kin and everyone to have to work a little harder for my cheers. So, I’m docking this 1/2 star. (which is easy to do because on Goodreads/Amazon/NetGalley I have to round up, because they won’t accept half-stars, so the ratings average still gets to stay high). Heart, soul, laughs, and heartbreak — I don’t know what else you want out of a time travel story. Or any story, really. Characters you can like (even when they do things you don’t like), characters you want to know better, characters you want to hang out with after the story (or during it, just not during the major plot point times), and a great plotline. This book is about as good as it gets. Grab your copy now while I start eagerly anticipating Chen’s next book. Disclaimer: I received this eARC from HARLEQUIN – MIRA via NetGalley in exchange for this post — thanks to both for this. These are my own honest — and hopefully not convoluted — thoughts and opinions.